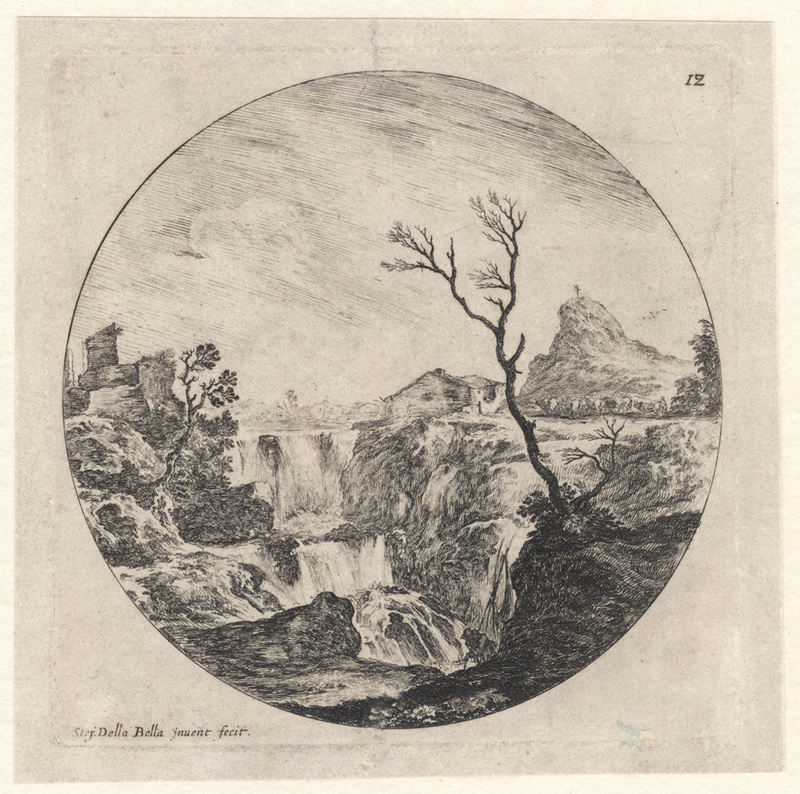 “Landscape with Waterfalls” (Rijksmuseum title), c1646, plate 12 from the series of 13 round compositions, “Views of Roman ruins and landscapes”, published in the first edition by François Langlois (1588–1647). 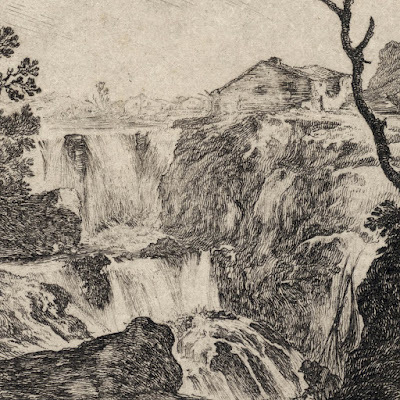 This impression was published by either Basan in 1772 or by H R Young in 1818. 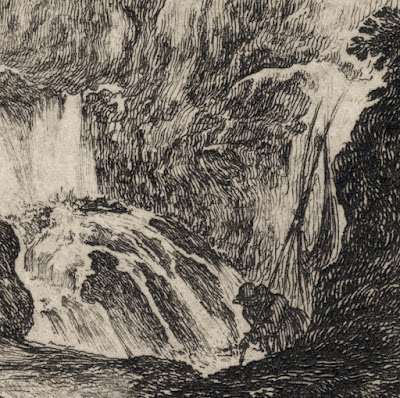 Etching on wove paper with small margins backed with a support sheet. 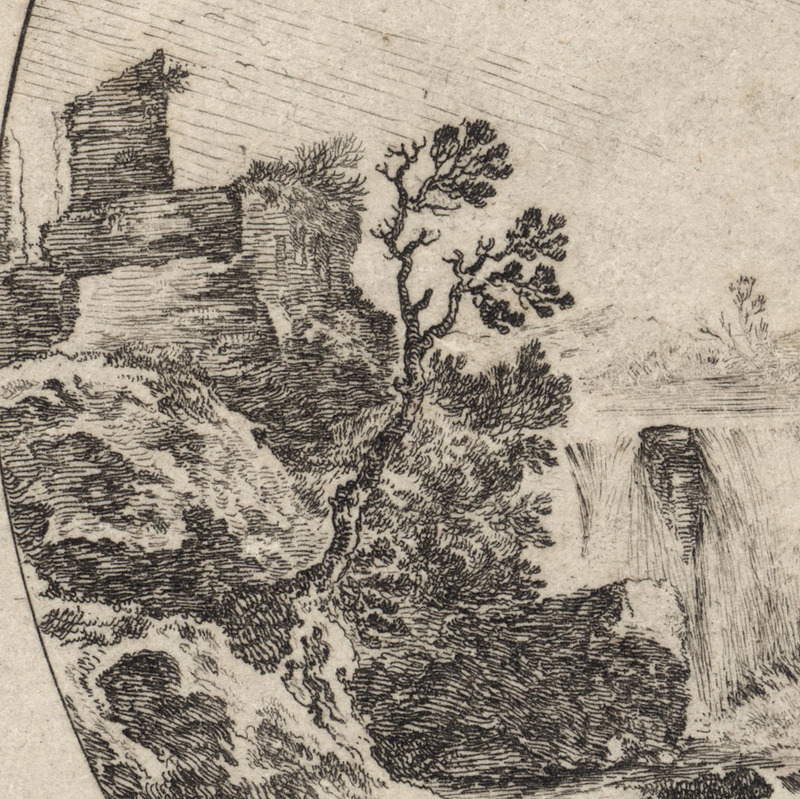 Lettered on the plate at lower left edge: "Stef. 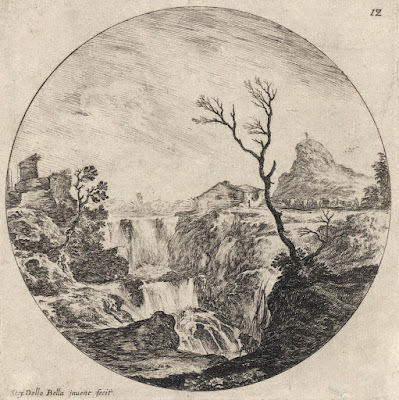 Della Bella inuent fecit." 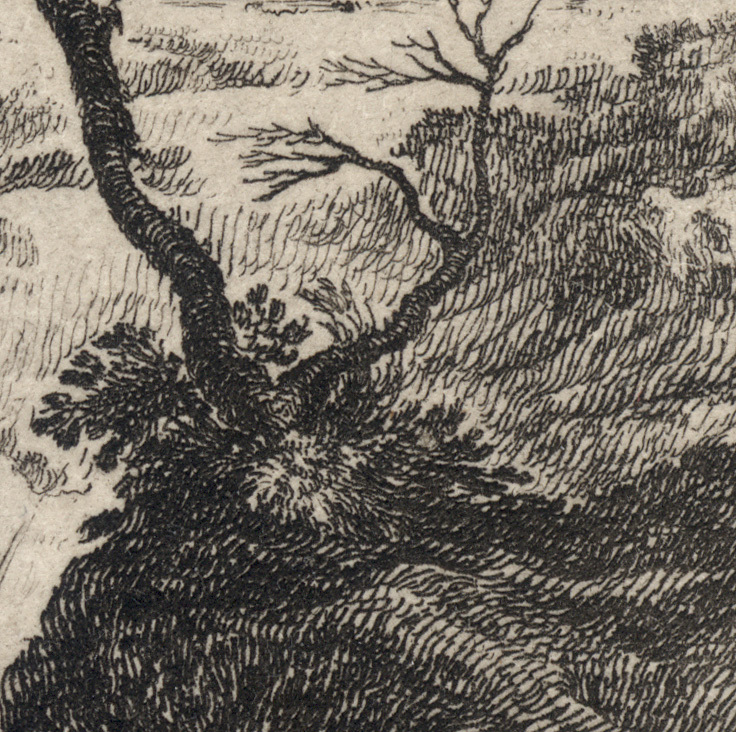 Condition: crisp, well-inked and well-printed impression in good condition with small margins (approx. 7 mm) and backed with an archival support sheet of millennium quality washi paper. There is a closed tear at the upper centre edge and the sheet shows signs of light handling (i.e. 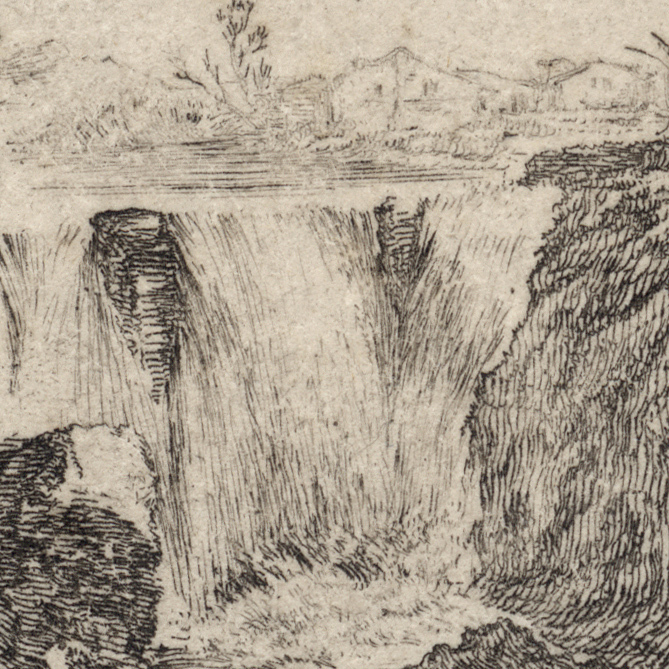 there is unevenness to the surface tone and whether this slightly mottled aspect of the paper is dirt, light abrasions or an intrinsic feature of paper I am uncertain). 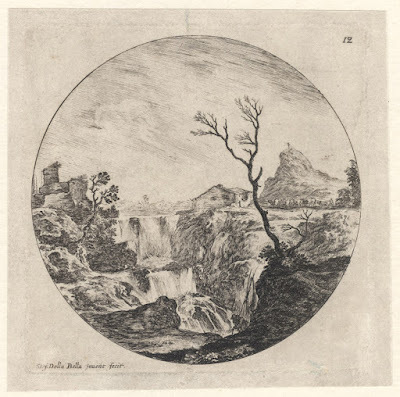 I am selling this round formatted image with its reference to ruins (see the tower on the far left), religion (see the cross on the distant mountain) and natural forces (see the torrent of water featured in the triple falls and the regenerating tree with its dead trunk in the foreground) for AU$146 in total (currently US$109.23/EUR92.64/GBP81.83 at the time of posting this listing) including postage and handling to anywhere in the world (but not, of course, any import duties/taxes imposed by some countries). If you are interested in purchasing this fascinating early landscape exemplifying Della Bella’s Mannerist leaning to portraying sparkling light and natural forces, please contact me (oz_jim@printsandprinciples.com) and I will send you a PayPal invoice to make the payment easy. 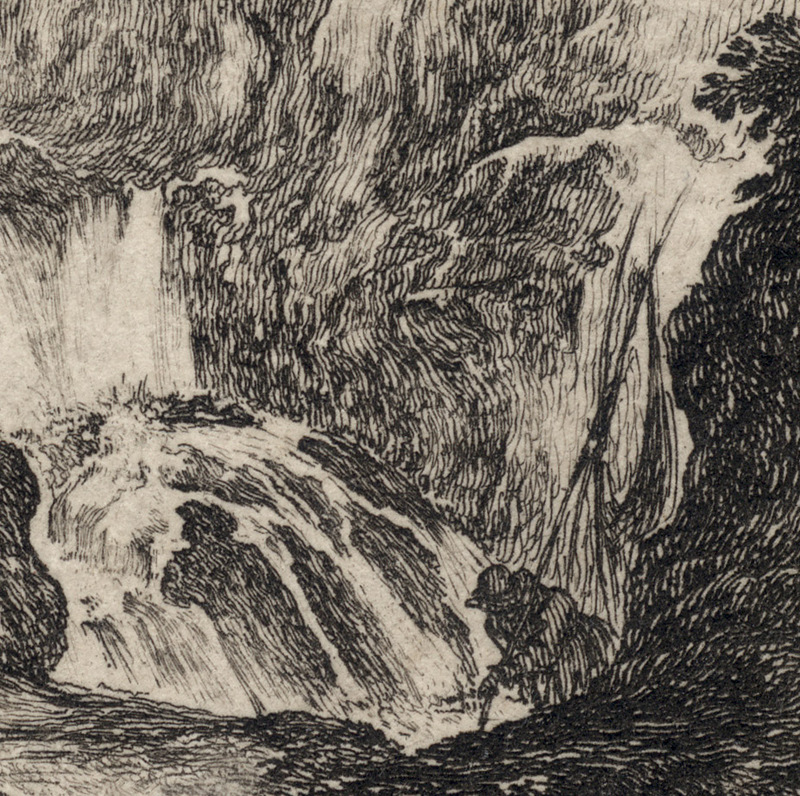 Although this etching could be overlooked by eyes accustomed to seeing romantic images featuring waterfalls, there is more to this print than a thin veil of loveliness. 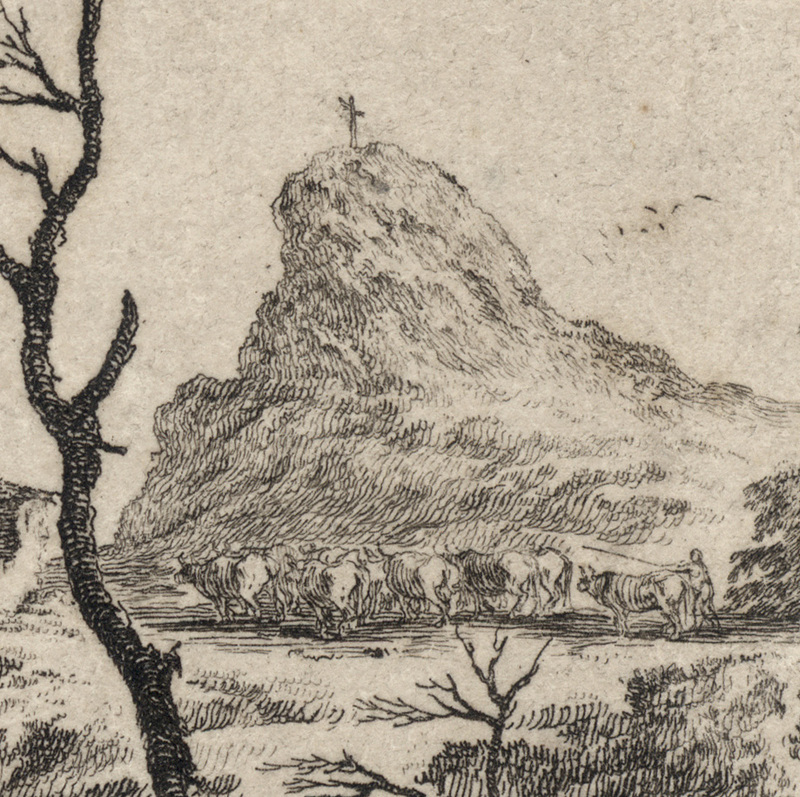 For instance, on the top of the far right mountain the artist has very intentionally featured a cross. 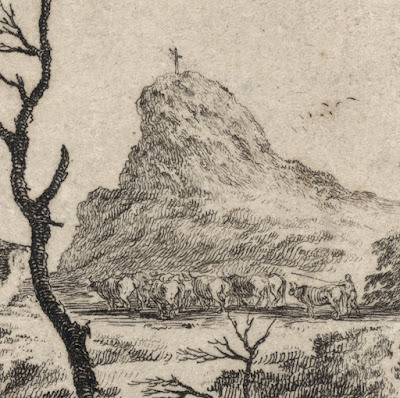 This tiny reference to Christianity is not an incidental feature. It adds a note of spirituality to the scene. Note also the ancient ruin of a building on the far left. Again this is not a landscape feature that just “happened to be there.” The significance of the antique ruin is designed to imbue the landscape with the subliminal idea that generations of folk have lived in the depicted landscape—and still live there based on the herd of cattle on the right of the waterfall and the fisherman at lower centre foreground. To my eyes the notion of a cycle of life and death is symbolised by the regenerating tree with its dead trunk in the immediate foreground.